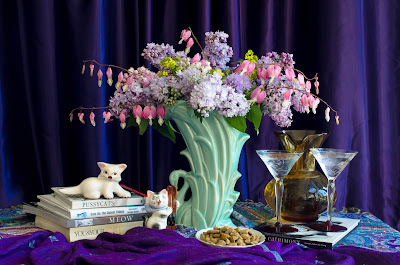 While my cat Sallie was feeling ill this weekend I created this still life portrait. Note the two ceramic cats, water to drink, treats and cat books. BTW, she's at the vet hospital getting fluids and more. Remaining optimistic until proven otherwise!!! In case you are interested, I am available for commissioned work to create a still life for your special person, animal or special occasion.